Hardness/Janka: Loblolly and shortleaf 690, 47% softer than Northern red oak; longleaf 870, 33% softer than Northern red oak. Dimensional Stability: Above average (change coefficient .00265; 28% more stable than red oak). 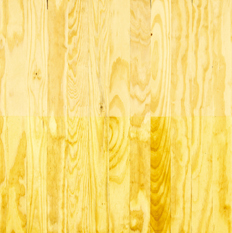 Durability: Soft, fairly durable, although not as resistant to scuffs, dents and abrasions as the hardwoods. Often used for flooring, but may not be suitable for all applications due to its softness. Comments: Generally manufactured for flooring with no end-match; sometimes flooring is "distressed" to create an antique look. ommodity item, available as unfinished strip and plank flooring in a variety of widths and thicknesses through specialty wood flooring dealers and some lumberyards.